Portable restroom rentals come in a wide variety of sizes with various features for enhanced comfort and sanitation. Portable Restroom Trailers is experiencing a significant uptick in international sales. With plans to deliver portable restroom rental units to Canada, Mexico, and Korea, small international businesses are investing in portable restroom rentals. Portable Restroom Trailers, LLC is announcing an important update to their portable restroom rental business in the international market. As the World Economic Forum wraps up in Davos, Switzerland, significant trade barriers have been lifted for international markets. Portable Restroom Trailers is experiencing a significant uptick in international sales. With plans to deliver portable restroom rental units to Canada, Mexico, and Korea, small international businesses are investing in portable restroom rentals. Portable Restroom Trailers, LLC offers the largest restroom rental inventory selection in the industry from 7 different manufactures. Units can be customized to meet specific local needs, such as, international wiring, electrical voltage, width, height, curb weight, waste and freshwater tanks, and more. We are pleased to build relationships with international clients investing in US goods and workers. Many top investors attended the 2018 World Economic Forum, and are reporting the positive effects of this monetary change in the valuation of the dollar versus other currencies. Jamie Dimon as seen on Nightly Business Report / CNBC that the drop in the dollar is not an unordinary event and does not reflect our stock market or business potential. International portable restroom rental companies are very attuned to the exchange rate and are taking advantage of this opportunity to purchase US goods at a more affordable price. Portable Restroom Trailers, LLC offers luxury portable restroom trailers, ADA restroom trailers, shower trailers, and more. Restroom rental units are equipped with the exclusive Smarter Restrooms App allows complete management and monitoring from any smartphone. Portable Restroom Trailers is the #1 leader in the portable restroom trailers industry. 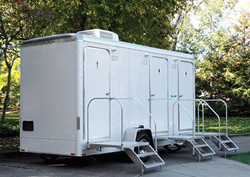 For more information about Portable Restroom Trailers, LLC and the Smarter Restrooms App, please contact Portable Restroom Trailers’ Operations Manager, Teri Pahon at 877-600-8645 or Teri@PortableRestroomTrailers.com.